A coffee bearer, from the Ottoman quarters in Cairo, Egypt in the year 1857. A coffee cafè in Melbourne. Coffee culture describes a social atmosphere, or a series of associated social behaviours, that depends heavily upon coffee, particularly as a social lubricant. The term also refers to the diffusion and adoption of coffee as a widely consumed stimulant by a culture. In the late 20th century, espresso became an increasingly dominant form of such a culture, particularly in the Western world and urbanized centers around the globe. The culture formation around coffee and coffeehouses dates back to 14th century Turkey. Coffee houses in Western Europe and the Eastern Mediterranean were not only social hubs, but artistic and intellectual centers as well. For example, Les Deux Magots in Paris, now a popular tourist attraction, was once associated with the intellectuals Jean-Paul Sartre and Simone de Beauvoir. In the late 17th and 18th centuries, coffeehouses in London became popular meeting places for artists, writers, socialites, and also centers for political and commercial activity. Elements of today's coffeehouses, such as slower paced gourmet service, tastefully decorated environments, or social outlets such as open mic nights, have their origins in early coffeehouses and continue to form part of coffee culture. In the United States, coffee culture is frequently used to designate the ubiquitous presence of espresso stands and coffee shops in the Seattle Metropolitan area, along with the spread of business franchises such as Starbucks. Other aspects of coffee culture include the presence of free wireless Internet access for customers, many of whom regularly do business or personal work in these locations for hours. Coffee culture varies by country, state and city. For example, the strength of existing café-style coffee culture in Australia explains Starbucks' poor performance in the continent. In urban centers around the world, it is not unusual to see several espresso shops and stands within walking distance of one another, or on opposite corners of the same intersection. Thus, the term coffee culture is also used in popular and business media to describe the deep impact of the market penetration of coffee-serving establishments. A coffeehouse or café is an establishment which primarily serves coffee or other hot and cold drinks. Historically, cafés have been important social gathering places in Europe. They continue to be venues where people gather to talk, write, read, entertain one another, or pass the time. During the 16th century, coffeehouses were banned in Mecca because they attracted political gatherings. In 2016, Albania surpassed Spain as the country with the most coffee houses per capita in the world. In fact, there are 654 coffee houses per 100,000 inhabitants in Albania; a country with only 2.5 million inhabitants. Café culture in China has grown rapidly over the years: Shanghai alone has an estimated 6,500 coffee houses, including small chains and larger corporations like Starbucks. In addition to coffee, many cafés also serve tea, sandwiches, pastries, and other light refreshments. Some cafés provide other services, such as wired or wireless internet access (the name, internet café, has carried over to stores that provide internet service without any coffee) for their customers. Many social aspects of coffee can be seen in the modern-day lifestyle. By absolute volume, the United States is the largest market for coffee, followed by Germany and Japan. Canada, Australia, Sweden and New Zealand are also large coffee-consuming countries. Tim Hortons' is Canada's largest coffee chain, pouring millions of cups of coffee a day. The Nordic countries consume the most coffee per capita, with Finland typically occupying the top spot with a per-capita consumption of 12 kg per year, followed by Norway, Iceland and Denmark. Consumption has also vastly increased in recent years in the traditionally tea-drinking United Kingdom, but still below 5 kg per year as of 2005. Turkish coffee is popular in Turkey, the Eastern Mediterranean, and southeastern Europe. 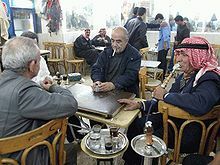 Coffeehouse culture has had a strong cultural penetration in much of the former Ottoman Empire, where Turkish coffee remains the dominant style of preparation. The coffee enjoyed in the Ottoman Middle East was produced in Yemen/Ethiopia, despite multiple attempts to ban the substance for its stimulating qualities. By 1600, coffee and coffeehouses were a prominent feature of Ottoman life. There are various scholarly perspectives on the functions of the Ottoman coffeehouse. Many of these argue that Ottoman coffeehouses were centers of important social ritual, making them as, or more important, than the coffee itself. "At the start of the modern age, the coffee houses were places for renegotiating the social hierarchy and for challenging the social order". Coffee has been important in Austrian and French culture since the late 19th and early 20th centuries. 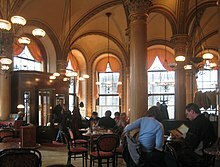 Vienna's coffeehouses are prominent in Viennese culture and known internationally, while Paris was instrumental in the development of "café society" in the first half of the 20th century. In France, coffee consumption is often viewed as a social activity and exists largely within the café culture. Espresso based drinks, including but not limited to Café au lait and Café crèma, are most popular within modern French coffee culture. Notably in Northern Europe, coffee parties are a popular form of entertainment. The host or hostess at the coffee party also serves cake and pastries, sometimes homemade. In Germany, Netherlands, Austria and the Nordic countries, strong black coffee is also regularly consumed along with or immediately after main meals such as lunch and dinner, and several times a day at work or school. In these countries, especially Germany and Sweden, restaurants and cafés will often provide free refills of black coffee, especially if customers have also bought a sweet treat or pastry with their drink. Coffee has played a large role in history and literature because of the effects of the industry on cultures where it is produced and/or consumed. Coffee is often regarded as one of the main economic goods used in imperial control of trade. The colonized trade patterns in goods such as slaves, coffee, and sugar, defined Brazilian trade for centuries. Coffee in culture or trade is a central theme and prominently referenced in poetry, fiction, and regional history. Coffee break in Belgrade, Serbia. A coffee break is a routine social gathering for a snack or short downtime by employees in various work industries. Coffee breaks allegedly having originated in the late 19th century by the wives of Norwegian immigrants in Stoughton, Wisconsin, is celebrated there every year with the Stoughton Coffee Break Festival. In 1951, Time Magazine noted that "since the war, the coffee break has been written into union contracts". The term subsequently became popular through a 1952 ad campaign of the Pan-American Coffee Bureau which urged consumers, "give yourself a Coffee-Break — and Get What Coffee Gives to You." John B. Watson, a behavioral psychologist who worked with Maxwell House later in his career to help popularize coffee breaks within American culture. Coffee breaks often last for 10 to 20 minutes, occurring at the end of the first third of the work shift. In some companies and some civil service, the coffee break may be observed formally at a set hour. In some places, a cart with hot and cold beverages, cakes, breads, and pastries arrives at the same time in the morning and afternoon. Employers may also contract with an outside caterer for daily service, or coffee breaks may take place away from the actual work-area in a designated cafeteria or tea room. In 2016, Albania surpassed Spain by becoming the country with the most coffee houses per capita in the world. There are 654 coffee houses per 100,000 inhabitants in Albania, a country with only 2.5 million inhabitants. This is due to coffee houses closing down in Spain because of the economic crisis and there is an equal amount of cafés opening and closing in Albania. In addition, the fact that it was one of the easiest ways to make a living after the fall of communism in Albania, together with the country’s Ottoman legacy to further reinforce the strong dominance of coffee culture in Albania. In Esperanto culture, a gufujo (plural gufujoj) is a non-alcoholic, non-smoking, makeshift, European-style café that opens in the evening. Esperanto speakers meet at a specified location, either a rented space or someone's house, and enjoy live music or readings with tea, coffee, pastries, etc. There may be cash payment with as expected in an actual café. It is a calm atmosphere in direct contrast to the wild parties that other Esperanto speakers might be having elsewhere. Gufujoj were originally intended for people who dislike crowds, loud noise, and partying. In Italy, locals drink coffee at the counter, as opposed to taking it to-go. Italians serve espresso as the default coffee, don't flavor espresso, and don't drink cappuccinos after 11 a.m.
Family in Söderhamn, Sweden seated for fika around 1916. Swedes have fika (Swedish pronunciation: [²fiːka]), meaning "coffee break", often with pastries, although coffee can be substituted with tea, juice, lemonade, or squash for children. The tradition has spread throughout Swedish businesses around the world. Fika is a social institution in Sweden and the practice of taking a break with a beverage and snack that is widely accepted as central to Swedish life. As a common mid-morning and mid-afternoon practice at workplaces in Sweden, fika may also function partially as an informal meeting between co-workers and management people, and it can even be considered impolite not to join in. A sandwich, fruit or a small meal may be called fika as the English concept of afternoon tea. In the 1920s, only wealthy people or those with high social status could drink coffee because people believed that coffee was a luxury good. From an ordinary person's perspective, they could not drink coffee because they could not afford the high price. Yuan Yang (coffee with tea) was invented in Hong Kong in 1936. An American college course entitled "Design of Coffee" is part of the chemical engineering curriculum at University of California, Davis. A research facility devoted to coffee research was under development on the UC Davis campus in early 2017. Coffee culture frequently shows up in comics, television, and movies in a variety of ways. TV shows such as NCIS, show characters frequently with espresso in hand or people distributing to-go cups to other characters. The comic strips Adam and Pearls Before Swine frequently centers the strip around visiting or working at coffee shops. On the popular American TV show, Friends, the characters gather at the fictional coffee shop Central Perk during every episode. Daily Mail writer Philip Nolan stated that the spread of the coffee culture in Ireland is largely accredited to American television shows saying, "We saw it reflected in the lifestyles of our TV favorites the Friends gang in Central Perk drinking coffee instead of alcohol; Frasier and Niles having latte and biscotti in the [Café] Nervosa; every cop on TV being called out on a 911 just as he ambled back to his car with Dunkin' Donuts and a cup of strong, black coffee." ^ "Coffee culture: A history". Gourmet Traveller. Retrieved 2019-04-01. ^ "The Tradition Of Coffee And Coffeehouses Among Turks". www.turkishculture.org. Retrieved 2019-04-01. ^ Smith, Hazel (2018-03-26). "Deux Cafés, S'il Vous Plaît: Les Deux Magots & Café de Flore in Paris". France Today. Retrieved 2019-04-01. ^ Berg, Chris (2008-08-03). "Memo Starbucks: next time try selling ice to Eskimos". The Age. Melbourne. ^ "Coffee Market Analysis, Share, Size, Value | Outlook (2018-2023)". www.mordorintelligence.com. Retrieved 2019-04-01. ^ "Rekordi, Shqipëria kalon e para në botë për numrin e lartë të bar-kafeve për banor -". 19 February 2018. ^ Jourdan, Adam; Baertlein, Lisa. "China's budding coffee culture propels Starbucks, attracts rivals". Reuters. Reuters. Retrieved 9 February 2018. ^ a b "International Coffee Organization - Historical Data". Ico.org. Retrieved 2011-10-09. ^ ""Coffee Consumption Per Capita Worldwide"". IndexMundi Blog. Retrieved 2010-05-13. ^ Baram, Uzi (1999). "Clay tobacco pipes and coffee cup sherds in the archaeology of the Middle East: Artifacts of social tensions from the Ottoman past". International Journal of Historical Archaeology. 3: 137–151. ^ Mikhail, Alan (2014). The heart’s desire: Gender, urban space, and the Ottoman coffee house. Ottoman Tulips, Ottoman Coffee: Leisure and Lifestyle in the Eighteenth Century ed. Dana Sajdi. London: Tauris Academic Studies. pp. 133–170. ^ Daniel (2012-05-12). "The café culture in France". Café de Flore. Retrieved 2019-03-10. ^ "Stoughton, WI - Where the Coffee Break Originated". www.stoughtonwi.com. Stoughton, Wisconsin Chamber of Commerce. Archived from the original on 2009-05-20. Retrieved 2009-06-11. Mr. Osmund Gunderson decided to ask the Norwegian wives, who lived just up the hill from his warehouse, if they would come and help him sort the tobacco. The women agreed, as long as they could have a break in the morning and another in the afternoon, to go home and tend to their chores. Of course, this also meant they were free to have a cup of coffee from the pot that was always hot on the stove. Mr. Gunderson agreed and with this simple habit, the coffee break was born. ^ Hunt, Morton M. (1993). The story of psychology (1st ed.). New York: Doubleday. p. 260. ISBN 0-385-24762-1. [work] for Maxwell House that helped make the 'coffee break' an American custom in offices, factories, and homes. ^ "Albania ranked first in the World for the number of Bars and Restaurants per inhabitant". ^ Santoro, Paola (22 April 2016). "Your Cheat Sheet To Italian Coffee Culture". Huffington Post. Archived from the original on 27 June 2017. Retrieved 7 July 2018. ^ a b White, Merry (2012). Coffee Life in Japan. University of California Press; First edition (May 1, 2012). ISBN 0520271157. ^ "Coffee Market in Japan" (PDF). All Japan Coffee Association (AJCA). July 2012. ^ Henderson, Helene (2005). The Swedish Table. U of Minnesota P. p. xxiii-xxv. ISBN 978-0-8166-4513-8. ^ Hotson, Elizabeth. "Is this the sweet secret to Swedish success?". BBC. Retrieved 2017-02-02. ^ "Fika |sweden.se". sweden.se. 2014-05-08. Retrieved 2016-05-21. ^ Goldstein, Darra; Merkle, Kathrin (2005). Culinary cultures of Europe: identity, diversity and dialogue. Council of Europe. pp. 428–29. ISBN 978-92-871-5744-7. ^ Johansson Robinowitz, Christina; Lisa Werner Carr (2001). Modern-day Vikings: a practical guide to interacting with the Swedes. Intercultural Press. p. 149. ISBN 978-1-877864-88-9. ^ coffeeDeAmour (2015-10-28). "【香港歷史】 八十六年老字號 榮陽咖啡". 香港咖啡文化促進會. Retrieved 2019-03-03. ^ Observed, staff (2006). "New York World". OBSERVED. ^ a b Barber, Gregory (February 2017). "Brewmaster Bill: Inside the Coffee Lab". Alpha. WIRED (Magazine). p. 18. This page was last edited on 21 April 2019, at 03:47 (UTC).